Security guards often find themselves between a rock and a hard place. They are sometimes viewed as lazy or ineffective given that most guards one sees are either rotund or getting on in their years. For those who carry out their duties assiduously, they are seen as party-poopers. Their situation is not helped by the powers that be thinking that the security industry can be improved by slapping individual guards with fines and jail time, thus perpetuating the idea that the problem lies in the individual. Cue Guards Gone Wild by Loh Teck Yong. Either by coincidence or telepathy, Loh seemed to have anticipated this change in the security industry by writing about his experiences as a security guard which spanned decades. Mirroring the cheekiness of the title, Loh’s writing is exuberant, making the book an enjoyable read, which can be devoured in a couple of sittings. One could almost imagine the twinkle in his eye as he scribbles down his first draft. With anecdotes about know-it-all superiors, uncoöperative colleagues, and impenetrably bureaucratic management, it feels like Loh is shooting the breeze with his readers over post-work drinks. Hence, imagine my surprise when the second half of the book comes around. While retaining its breezy tone, Loh candidly reveals the tricks security companies get up to make up for the chronic problem of a lack of manpower. From staging a charade by co-opting guards from other posts during audits to allowing guards to go on 24-hour shifts, these scams—as Loh calls it—are worrying and indicates an underlying systematic problem in the security industry, rather than a problem with a few bad apples. 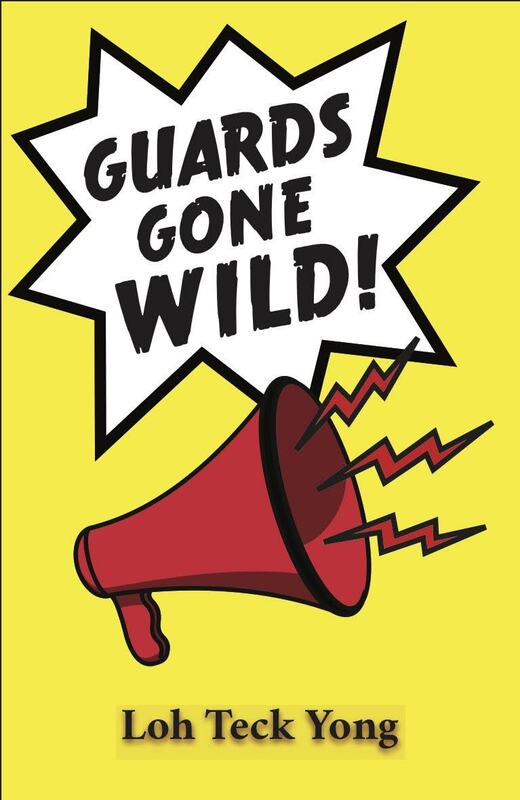 If any of this is true, Guards Gone Wild must be an initial prescribed reading for lawmakers to rethink their strategy, and an extensive surprise audit is in order for the security industry. That said, this book will benefit greatly from the guidance of a publishing company to par down certain excesses and correct the inconsistencies in typesetting. With this book being an entertaining and educational read, it is hard to see why any publishing company would not want to republish this book. Cherilyn Woo reimagines Faust by putting humanity front and centre. 24 March 2019, 3 p.m. Stage a conflict between God and Mephistopheles within a two-storey wooden structure? Recast Faust as a young woman? Rewrite the second part of Faust? Nine Years Theatre (NYT) new associate director Cherilyn Woo, has achieved all that and more in Faust/Us, the company’s Mandarin adaptation of Faust. This production marks a couple of firsts for the company: the first show that isn’t directed by Nelson Chia, and the first production in which a part of the plot is completely rewritten. Woo turns the cautionary tale of man’s greed into a humanistic piece that ennobles the human struggle. The wager between God (Hang Qian Chou) and Mephistopheles (Timothy Wan) is no longer a symbol of sin and redemption, but a childish and selfish bet at the expense of humanity. Faust is not a crazed man, but Jo Faust (Mia Chee), a woman who signs a pact with Mephistopheles after being bogged down by ennui. She does not fall in love with Grett (Neo Hai Bin) out of lust, but out of admiration of his writing. At the show’s climax, Faust does not give in to one side or the other, but proceeds with the pact on her own terms. This bold reimagination by Woo is arguably more in line with the Enlightenment ideals than Goethe’s version. While Faust/Us may not have ensemble scenes that have become a signature of NYT’s productions, Woo does tap into the ensemble training that the actors go through with occasional synchronised movements, and having Grett glide across the space as God tries to convince Faust to come to his side. Mia Chee balances between Faust’s ambition and her emotional vulnerability wonderfully, imbuing the titular character with more complexity. Timothy Wan’s Mephistopheles is quick-witted with a sharp tongue to match. Wan plays off Chee very well, charming her every step of the way. It is easy to see why anyone would root for the devil for most of the show. Neo Hai Bin endears himself to the audience with his earnest portrayal of the fruit seller, while sending students giggling when Grett and Faust are in the first blushes of love. Hang Qian Chou does not leave much of an impression as God, but elicits sympathy as Wagner, Faust’s faithful friend. It is difficult to stage a spectacle of cosmic proportions in such a small space. 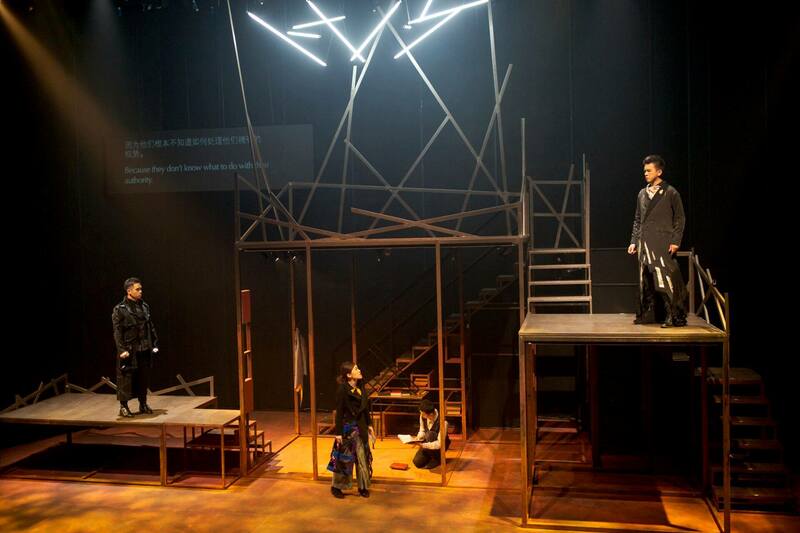 But lighting designer Adrian Tan and sound designer Zai Tang makes do by signalling a chance of space with coloured lights strategically fixed on to the set (designed by Petrina Dawn Tan) or a layered soundscape. The creative team must be commended for managing to create a foreboding atmosphere when Mephistopheles suddenly appears without resorting to the age-old trick of smoke machines. When she first appears, Faust laments that all human achievement will turn to dust eventually, and we are merely piling dust on layers of dust. Woo responds by clearing away centuries of dust and allowing us to view this tale afresh, while offering a glimmer of hope to the seemingly Sisyphean struggle that is life. “Theatre review: FAUST/US by Nine Years Theatre is fiendishly good” by Akshita Nanda, The Straits Times Life! Like any love-hate relationship, Singapore and Malaysia have often come to fisticuffs. But in Another Country, we waved at our cousins, raced across the room, pulled them up, and danced with them. We danced to the melodies and sentiments excavated from the texts of both countries that span five centuries. Drawing from literature, interviews, and even legal documents, Alfian Sa’at intricately weaves together the text for Sayang Singapura while Leow Puay Tin does the same for Tikam-Tikam: Malaysia@Random 2. 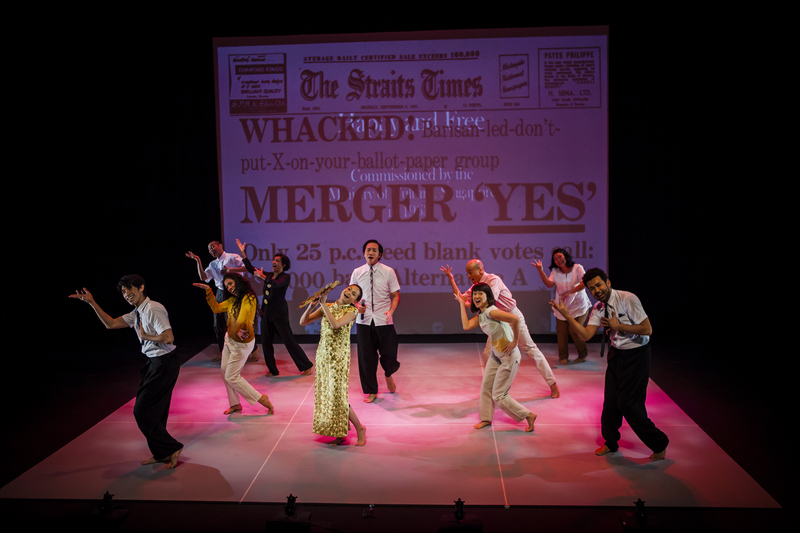 The Malaysian ensemble (Ghafir Akabar, Sharifah Amani, Anne James, Alfred Loh, Iedil Putra) interprets the Singaporean texts and the Singaporean ensemble (Sharida Harrison, Lim Yu-Beng, Gani Karim, Janice Koh, Siti Khalijah Zainal) performs the Malaysian texts. What emerges is a beautiful testament to the rich cultural resources we share that present a socio-historical account of the concerns that the writers had. This compels the audience to re-look at their own stories from a fresh perspective while listening and learning more about the other side. The curators must be applauded for picking texts which not only cover events running up to the merger or just after the separation, but also broach uncomfortable topics. Notable selections from the Malaysian corpus include Tunku Abdul Rahman dreaming of a bad omen which preceded the race riots in Malaysia, Amir Muhammed’s 120 Malay Movies which discusses Singapore marking the start of the national narrative at 1965 and parallels that with the Malaysians not acknowledging their cultural roots from the Hindu empires of old, and the self-reflexive The Myths that Cloak Our Theatre by Krishen Jit which criticises the industry for the lack of community theatre projects and turning theatre into a polished product meant for the middle classes to consume. The Singapore selection explores political censure, among other topics, by choosing The Campaign to Confer the Public Service Star on JBJ by Eleanor Wong, Fear of Writing by Tan Tarn How, and Gemuk Girls by Haresh Sharma. The most interesting choice of them all is Elangovan’s Talaq which portrays how some Indian-Muslim husbands intentionally misinterpret Islamic principles to justify their infidelity and subjugation of their brides from India. I was surprised that the Media Development Authority allowed this to pass given that they banned the original performance of the English script. I hope that the audience would be compelled to read the play in full and judge it for themselves. The possible dialogues sparked off by this production would not have been possible without the brilliant performances by both ensembles. Their talent and versatility are clear for all to see as they are able to smoothly transit between texts that have very different demands and characters. The actors are also able to command the stage during their individual scenes and immediately reintegrate back as an organic whole once that is over. I would not be surprised if this production gets a nomination for best ensemble at the Life! Theatre Awards and it will be such a lovely gift to the Malaysian actors as well. This project needs to be revisited every decade and updated with new and exciting writing. Apart from the texts we have, future iterations should boldly experiment with performance practices and forms. Who knows? Perhaps we could develop a performance vocabulary unique to both sides of the causeway—our own artistic secret handshake.